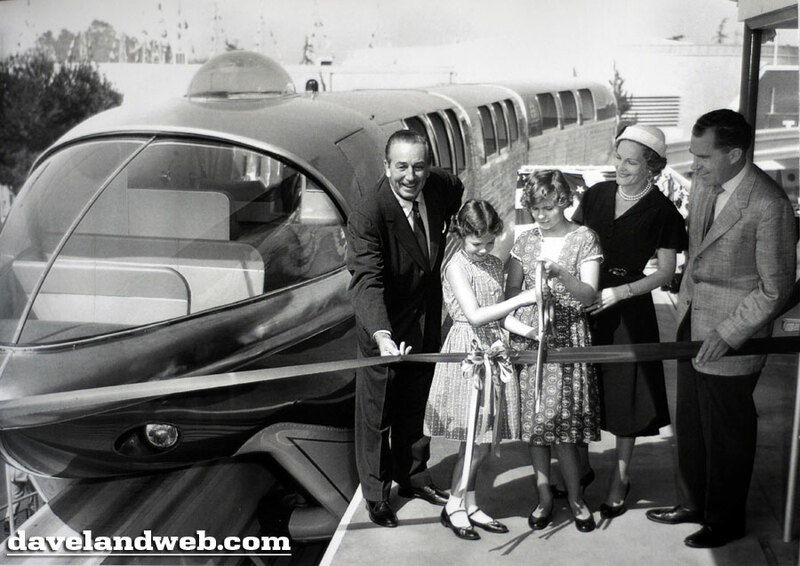 The biggest thrill of the day was cutting the ribbon for the Monorail. 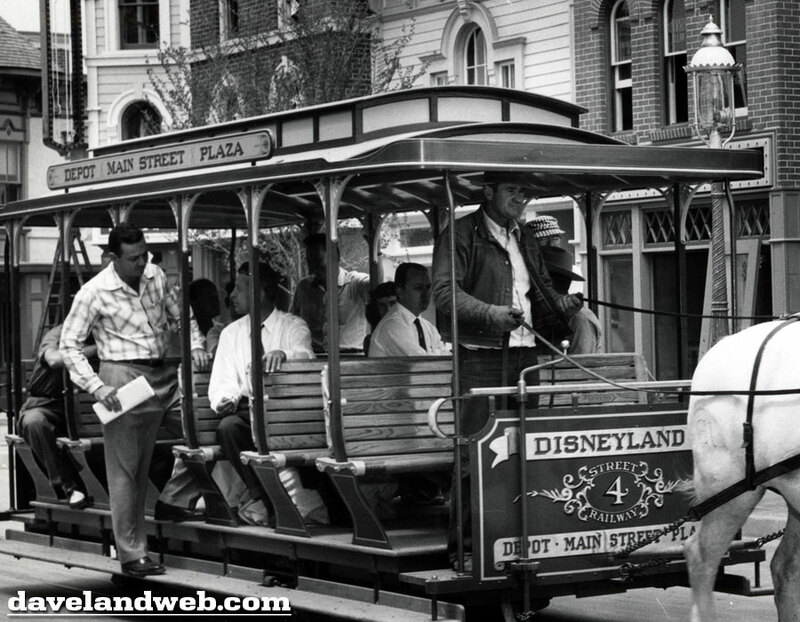 “I was a little scared—the Monorail was a different sensation. Up in the glass dome—looking over the park...it was quite a thrill for me at the time.” In preparing for the ceremony, Nixon had asked Walt how he wanted to be described in his introduction; Walt replied “as an Imagineer, which means an engineer with imagination.” Pictures #1 & #2 are posed after-the-fact shots; in shot #1, the ribbon is already gone, and in shot #2, Walt is holding it up for the cameras. 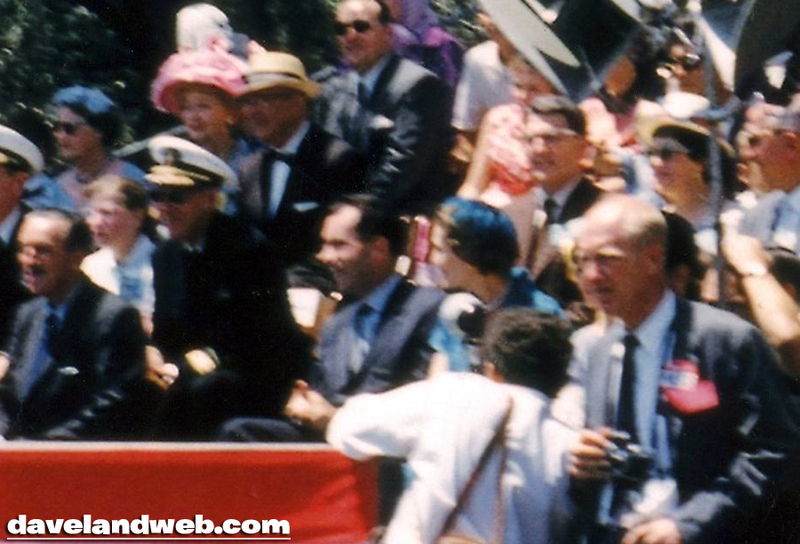 When watching the film clips today of the live telecast, you can see Lillian Disney darting into the frame. Here she is posing with everyone, most likely after the first ceremonial laps. Note: in these two photos, the Nixons are wearing different outfits for the ribbon cutting; when asked if possibly they had a practice photo session, Julie responded: “I do not recall a trial run or photo opportunity. We must have spent two days at the park. We never would have changed clothes twice in one day!” Anybody know about this second group of cutting photos in different outfits? After a very full day at Disneyland, the Nixons had a family reunion over at Knott’s Berry Farm. 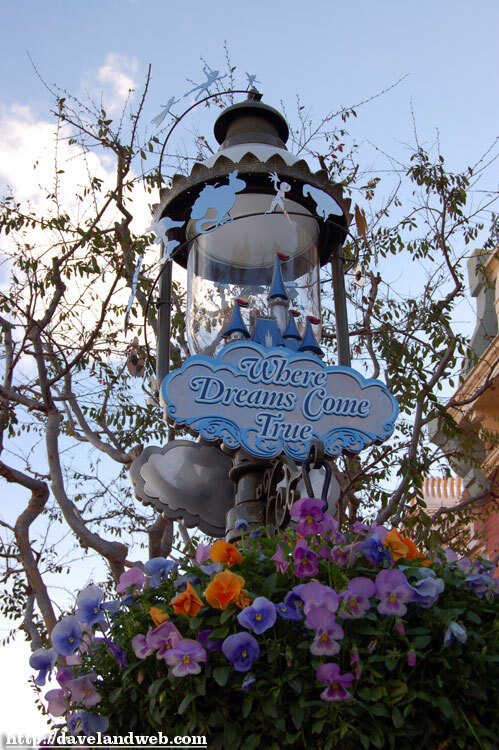 “Knotts was wonderful, but Disneyland was the highlight,” remembers Julie. Next up: 1968. 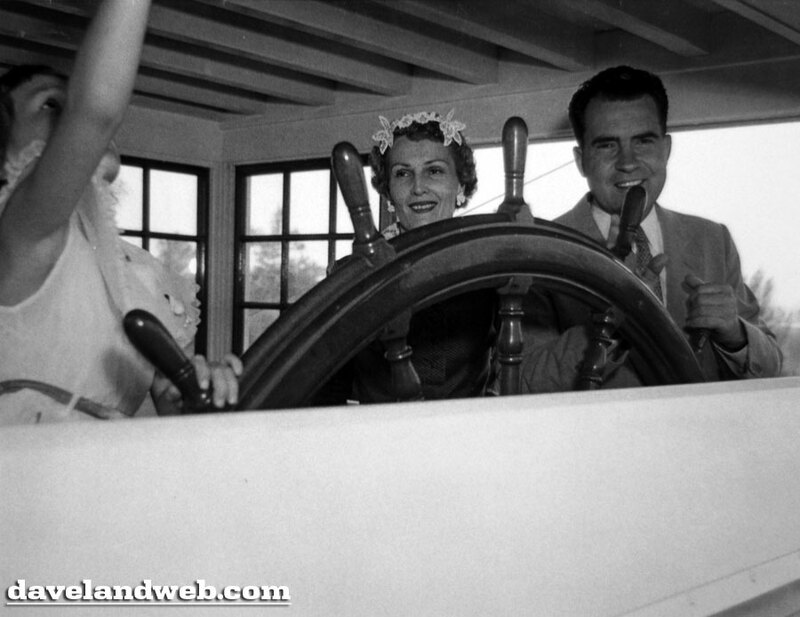 See more Nixon family photos at my regular website. 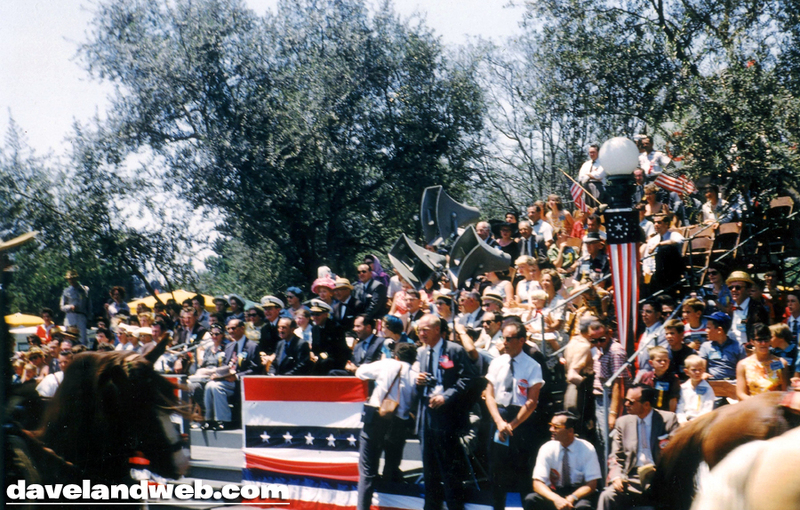 The grand opening festivities for Disneyland ’59 continue today with more images from the grandstand. 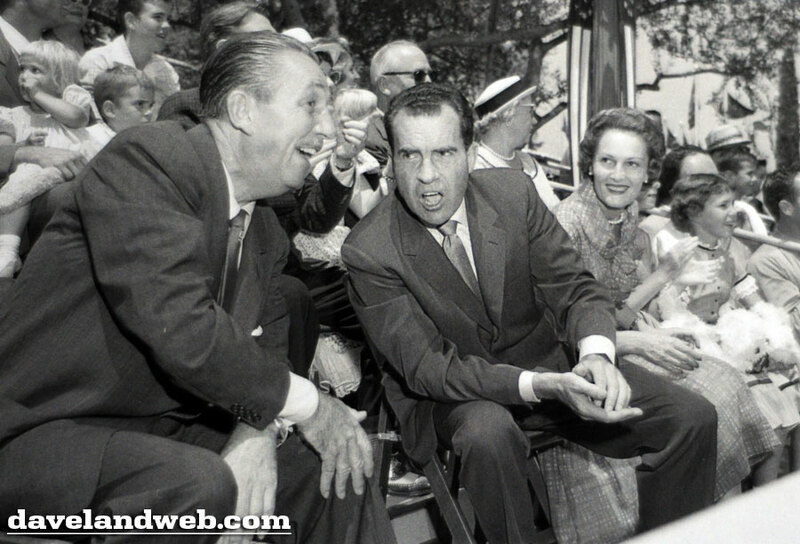 Vice President Nixon leans over the aisle to talk to Walt, while wife Pat smiles attentively. Daughter Julie is enjoying the entertainment in front of her. 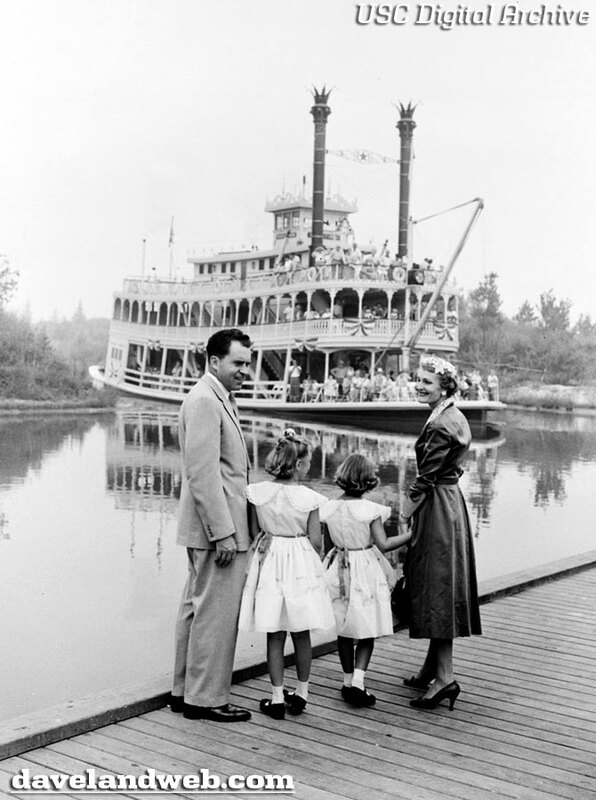 I believe the girl above Walt sucking her thumb is one of his granddaughters; possibly Tammy or Joanna Miller. Last one for today shows some unique entertainment for the opening festivities; it appears to be some kind of African Dance. 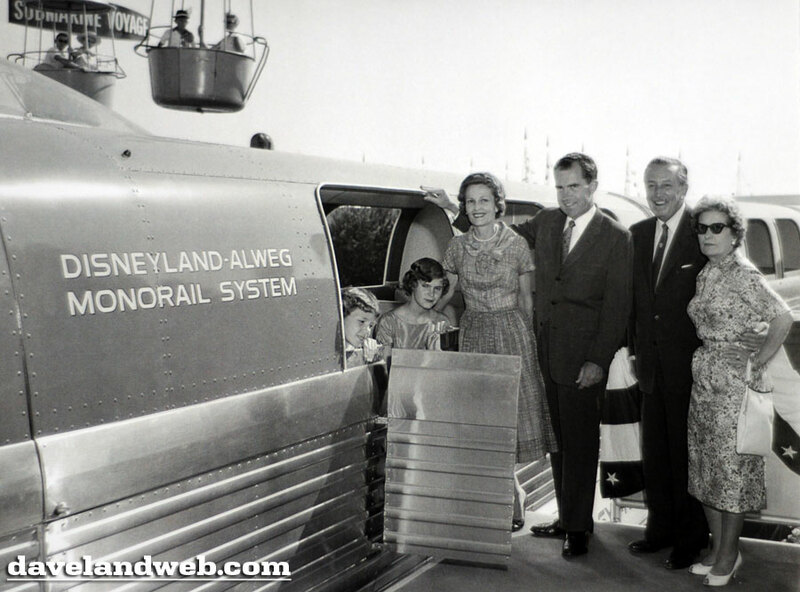 Next up: the unveiling of the Monorail. Follow my Daveland updates on Twitter. 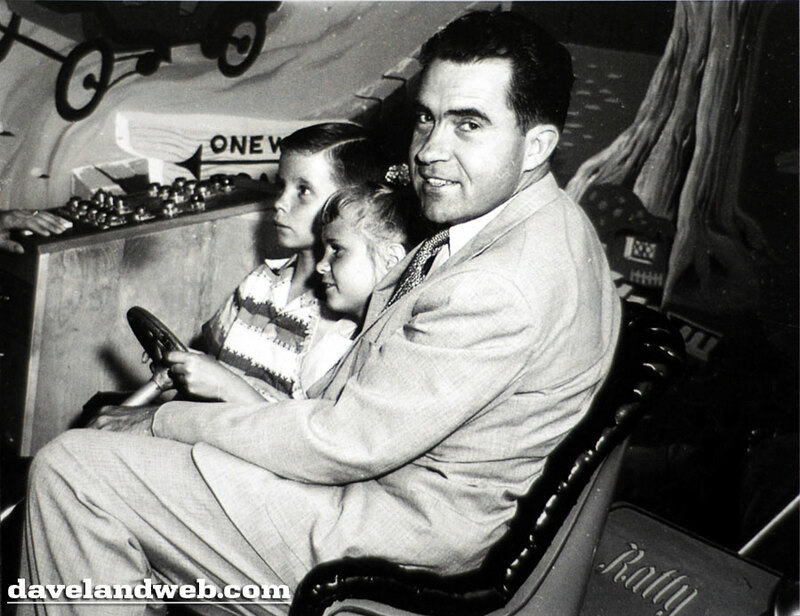 See more Nixon family photos at my regular website. Who could say “no” to an invitation like that?!? 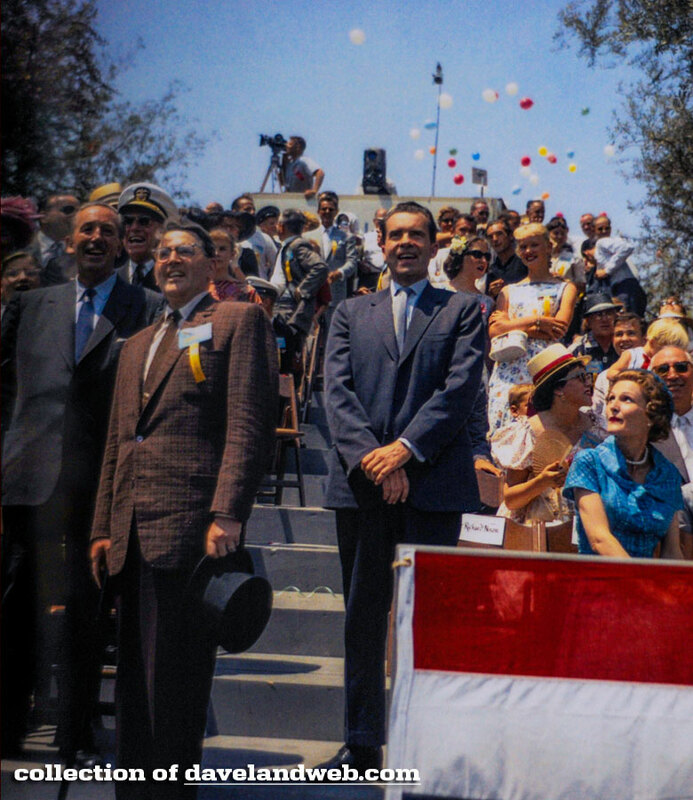 One of the biggest occasions (and most documented) that the Nixons visited the park was for the June 14, 1959 Monorail/Submarine/Matterhorn dedication. Walt asked Vice President Nixon (see the letter pictured above) if he would be an honored guest for the 5th Anniversary inaugural celebration. 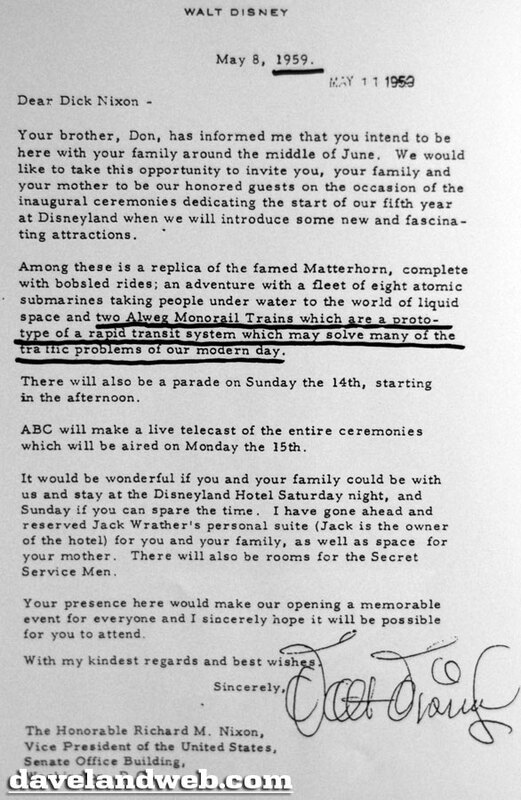 Jack Wrather’s (owner of the Disneyland Hotel) personal suite was reserved for the Nixon family for this trip (“I was thrilled to be there!” remembers Julie). 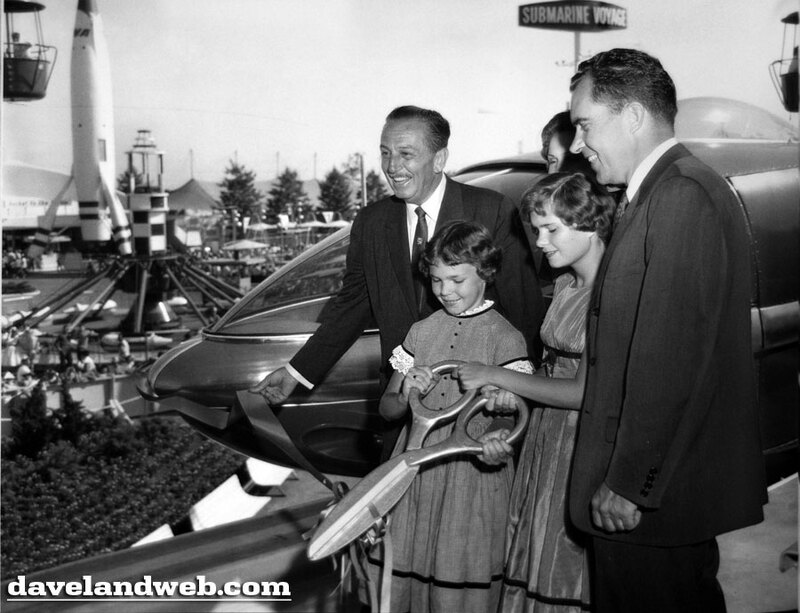 It is fantastic to see that Walt was not only interested in creating an amusement park for entertainment, but he was sincerely devoted to solving the problems of this country. 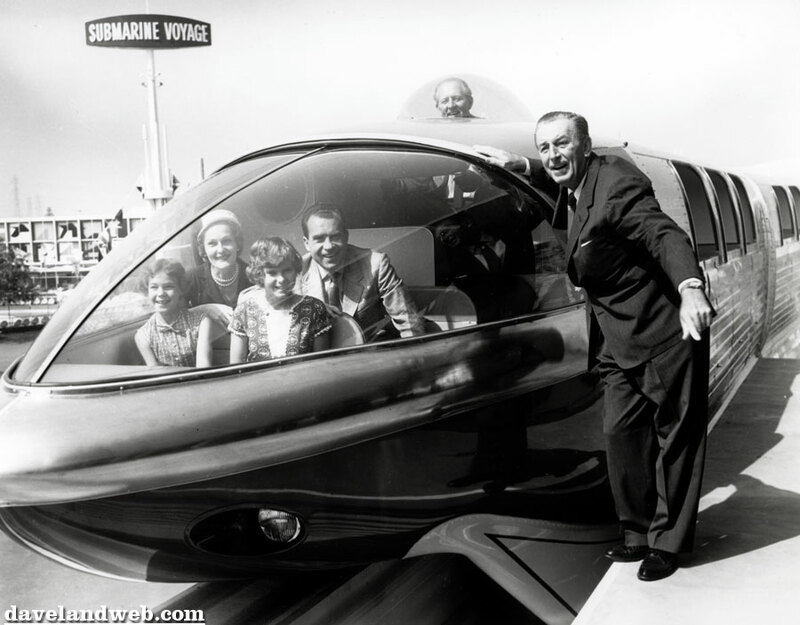 Too bad he isn’t still around to help with the traffic problems of today; a Monorail would still be a great solution to our freeway congestion. 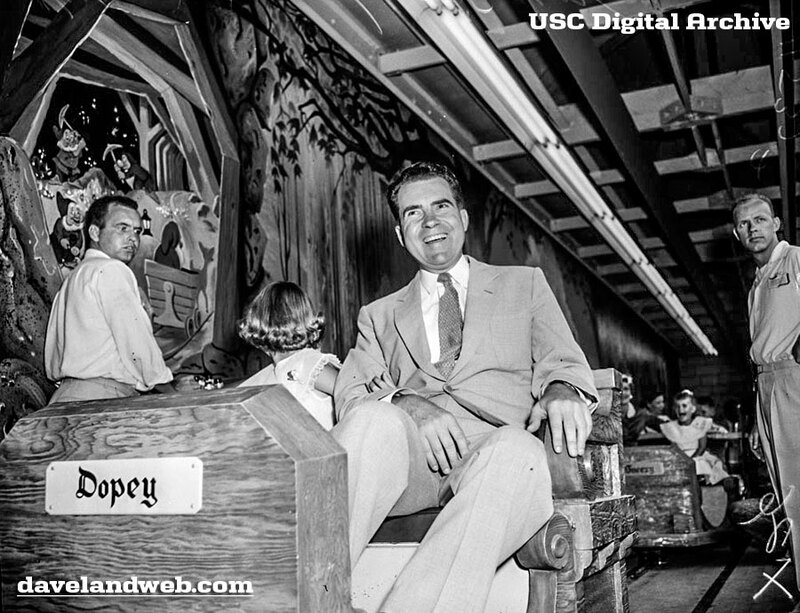 On Sunday while Nixon visited with his mother, Pat and the girls got to ride some of the attractions before all the hoopla began. “My father wanted to take his mother to church that morning. It was a special time for them. 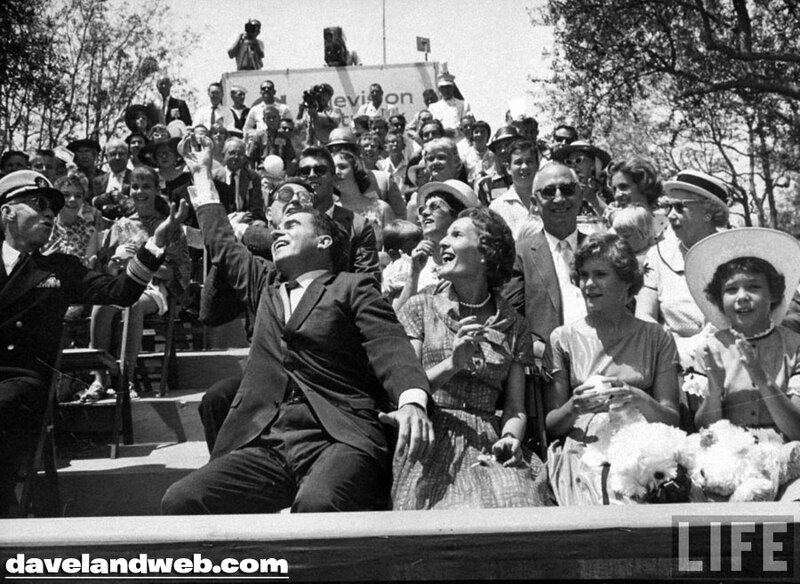 When he was growing up, the family often attended church three times on Sunday—church was a big part of a family’s social life.” For the big ceremonies, the Nixon family had lunch in Walt’s Apartment above the firehouse and then led the procession down Main Street. 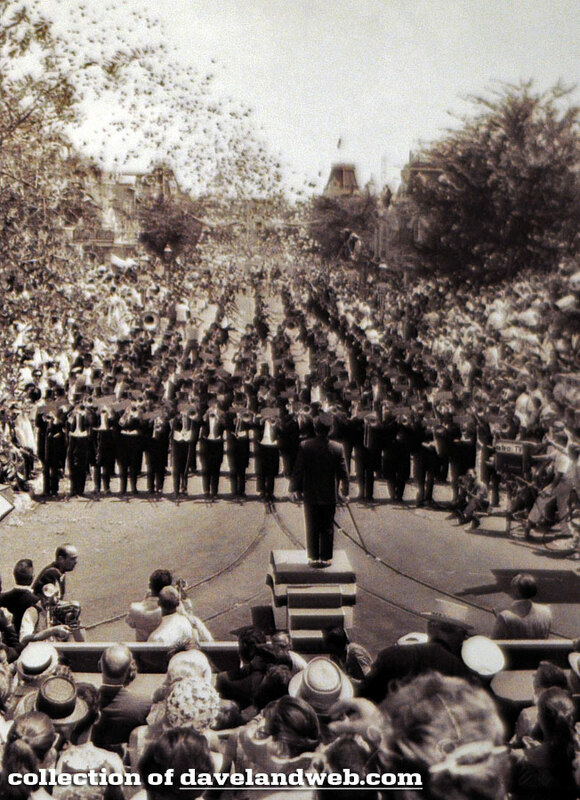 Here’s a photo of the opening ceremonies that kicked off the opening of three major attractions; happily, all three still exist at Disneyland today: The Monorail, The Matterhorn, and The Submarine Voyage (albeit with a theme change). 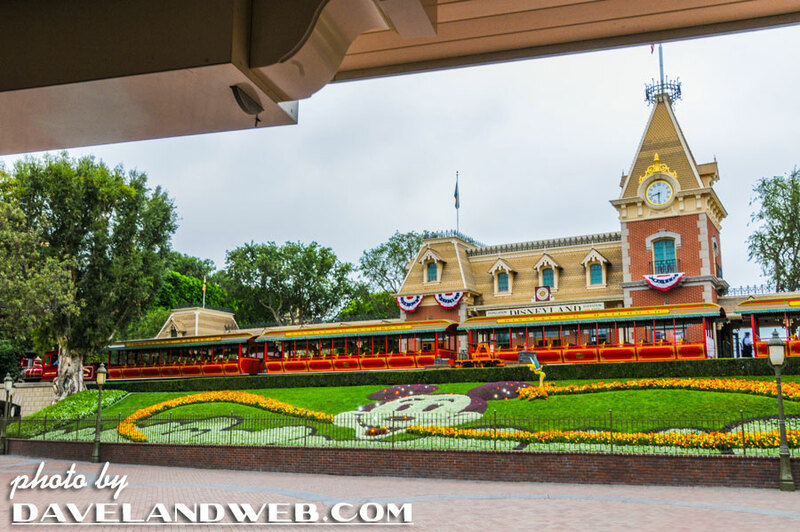 This photo was taken from the grandstand built in Central Plaza for VIP’s and the media, just for this celebration. 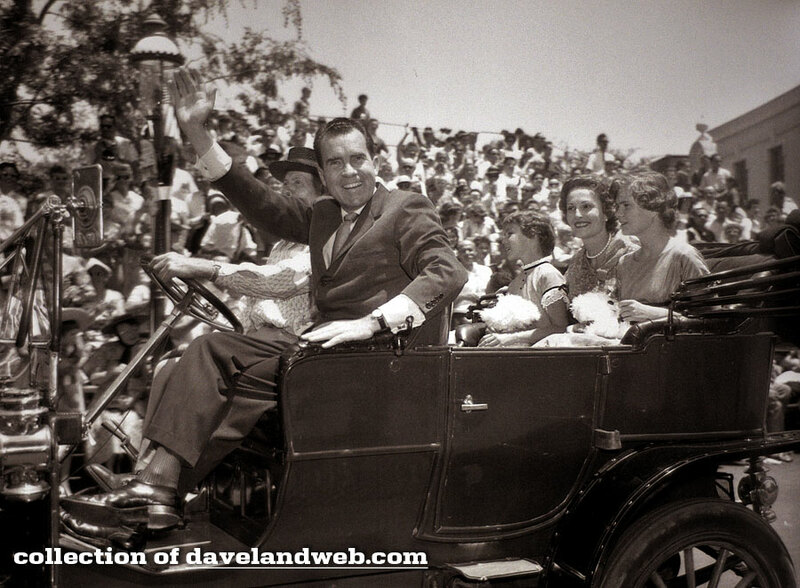 Here’s the Nixon family riding down Main Street; Julie, Pat, and Tricia in the backseat while Vice President Nixon waves enthusiasticaly to the crowd. 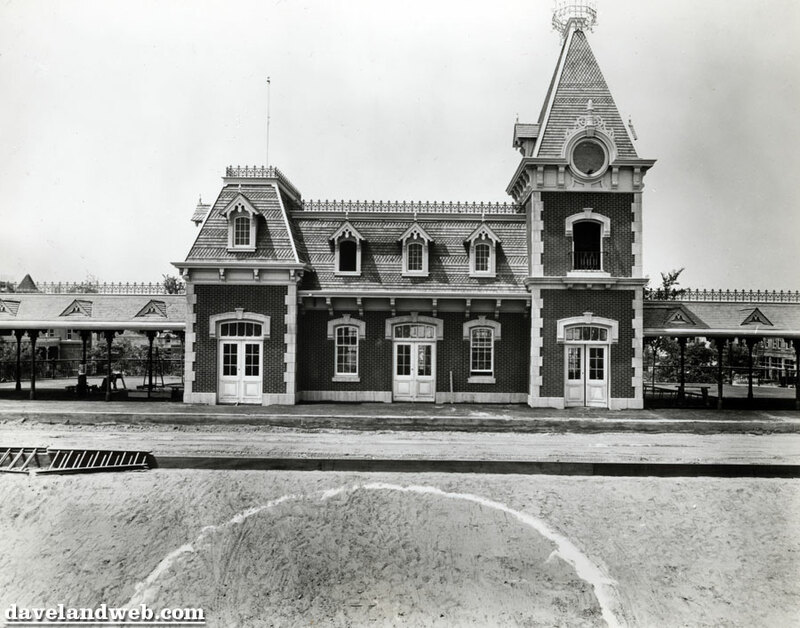 What follows are two never-before-seen color photos of the grandstand area, sent to me by a Daveland reader. 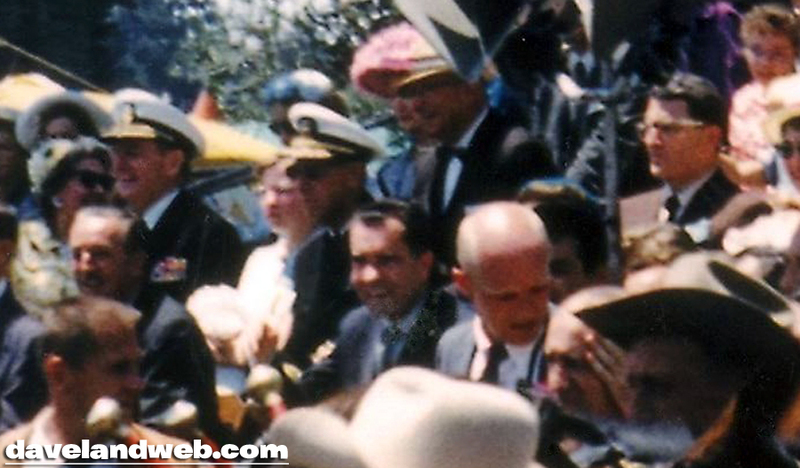 In this detailed closeup, you can clearly see Walt and Nixon; above them, Hedda’s frilly pink hat stands out like a sore thumb. 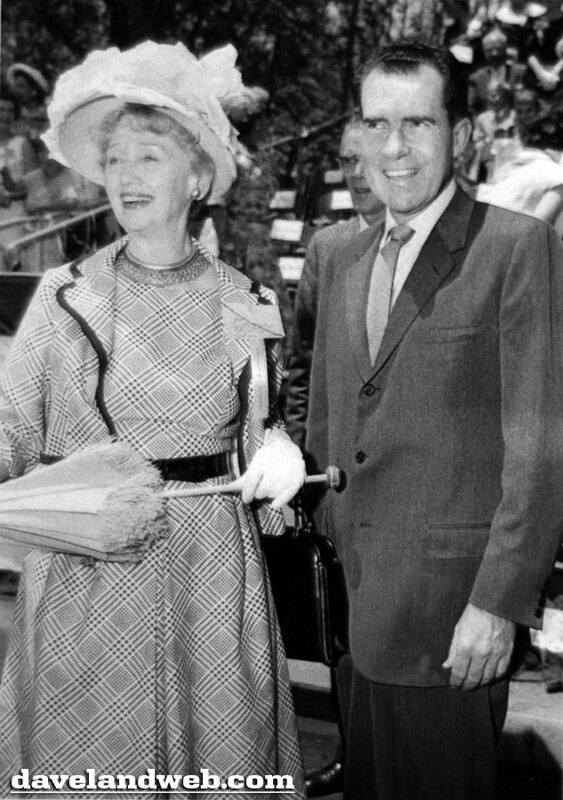 In this zoomed/cropped photo, you can also see Nixon’s lovely wife, Pat; they don’t come any classier than Patricia Ryan Nixon. 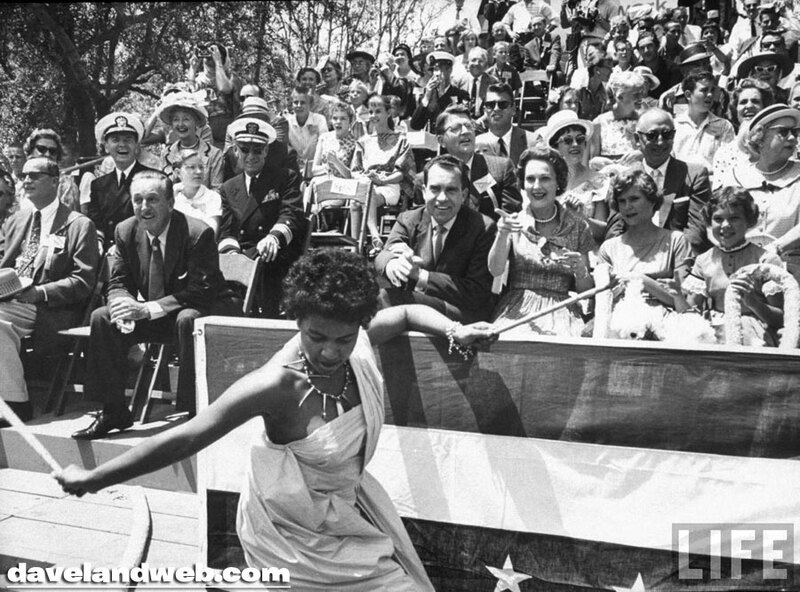 Tomorrow we will continue with this joyous June 14, 1959 celebration. 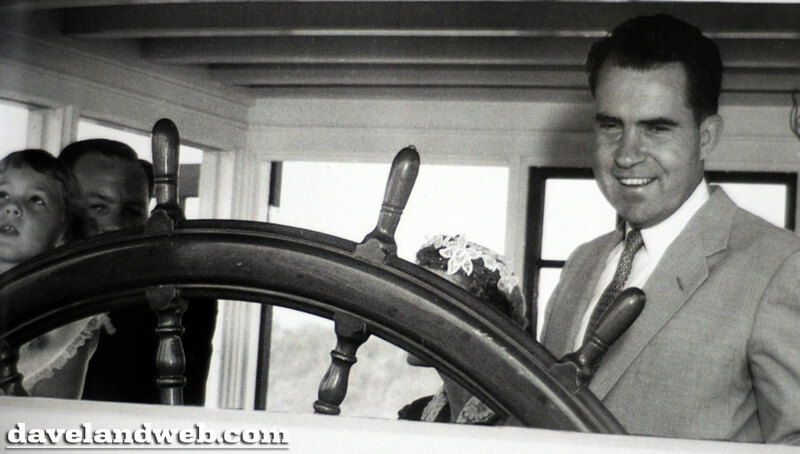 See more Nixon family photos at my regular website. 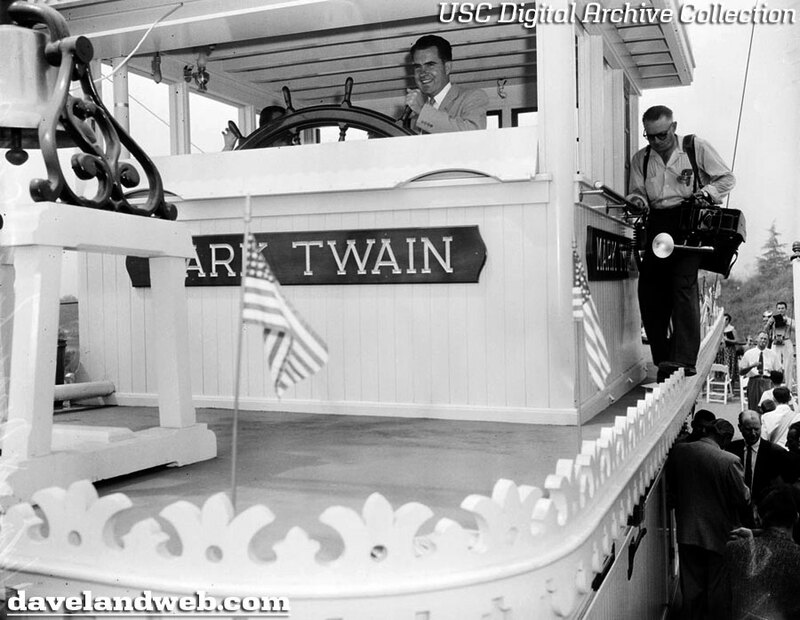 Vice President Nixon takes a turn “steering” the Twain while a photographer cautiously navigates the small deck around the wheelhouse. 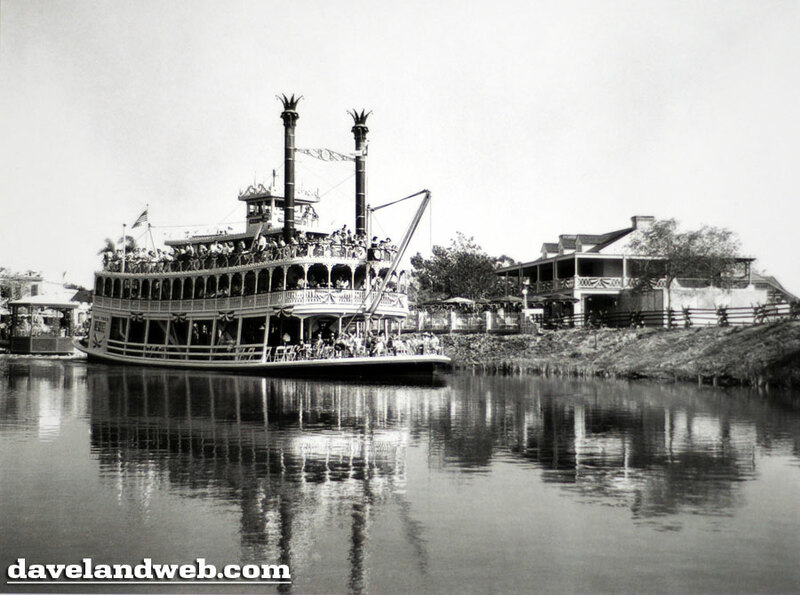 A beautiful shot of the Twain rounding the bend with the Nixon family aboard, passing the Chicken Plantation Restaurant. 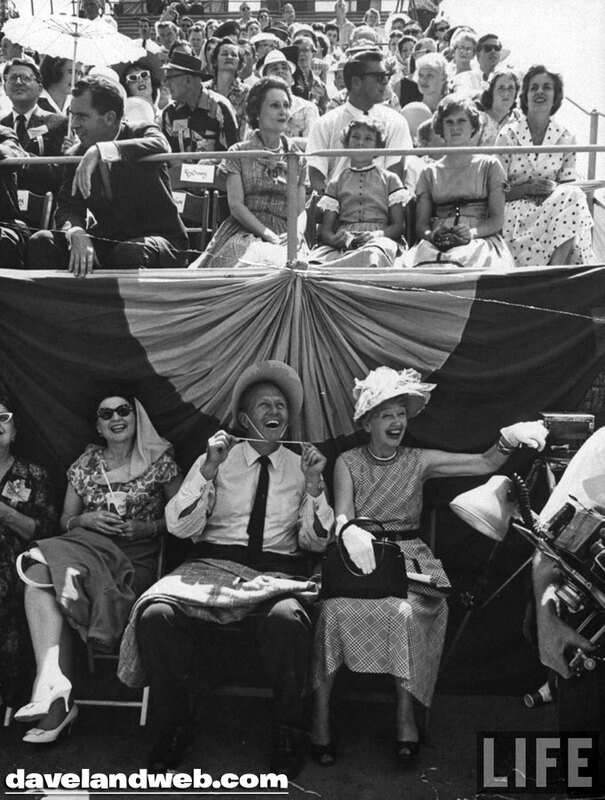 Walt gave the Nixon girls Mickey Mouse hats which they used to put on plays at home; Karen was Julie’s favorite Mouseketeer. 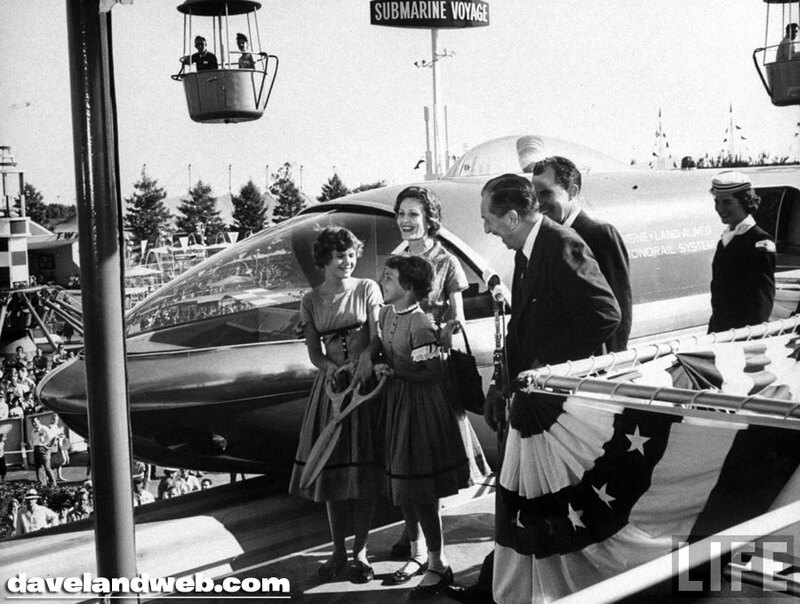 Tomorrow, the Nixons get invited to be honored guests at the June 14, 1959 new attraction festivities. 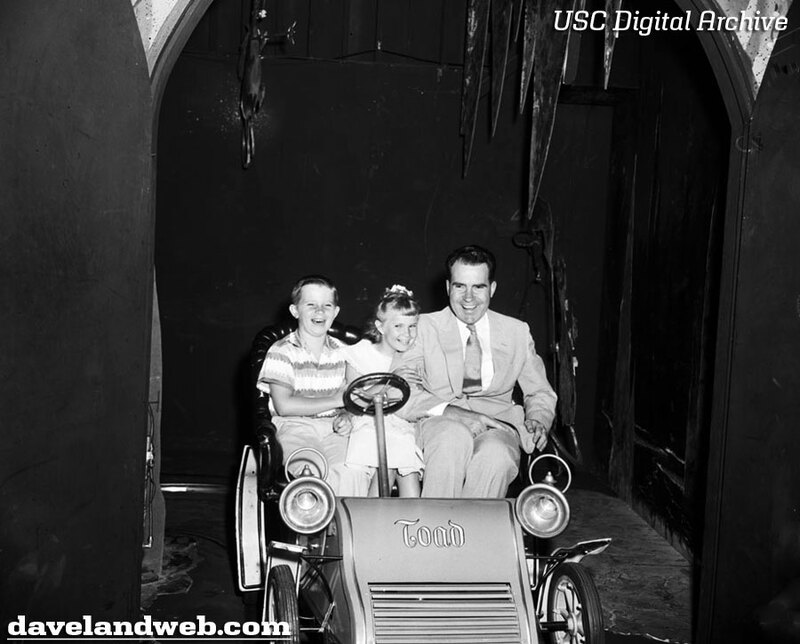 See more Nixon family photos at my regular website. 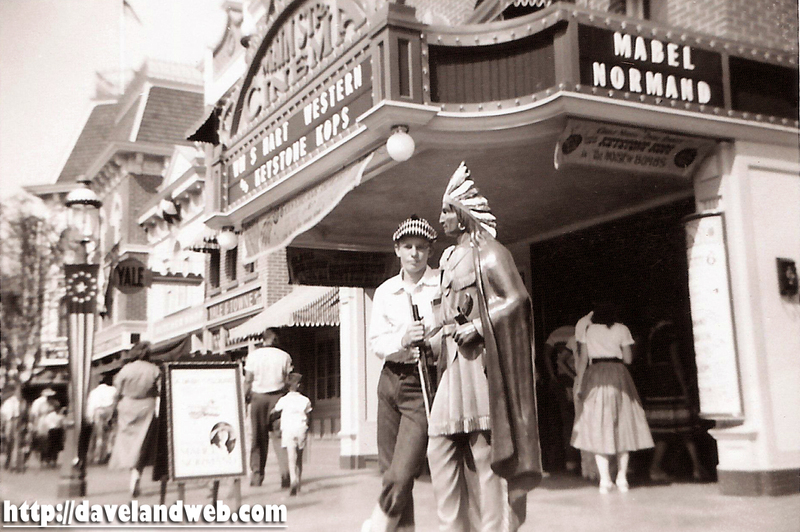 Now come the dark ride photos; definitely my favorite from this batch. First up is Peter Pan. 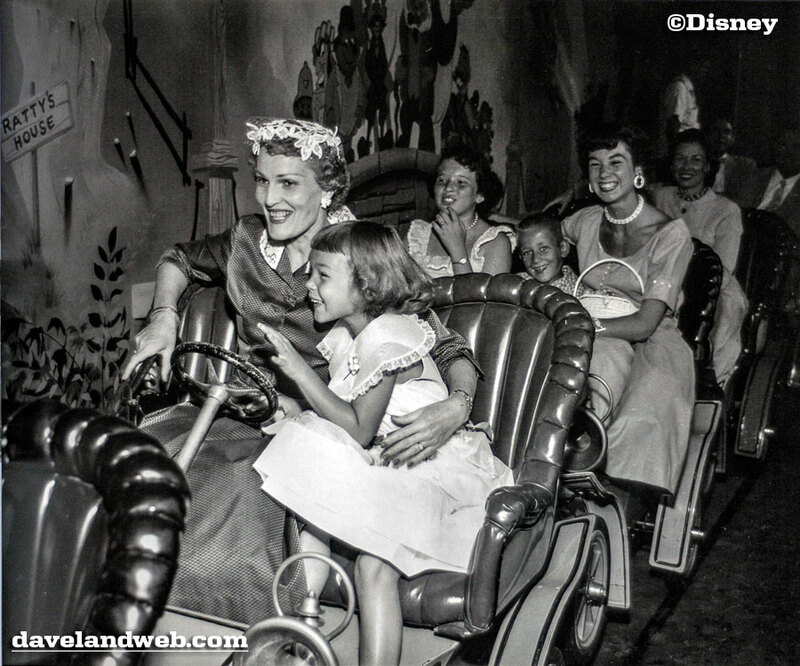 “My favorite ride was (and still is) the Peter Pan ride,” says daughter Julie. Nixon flies off with one of Julie’s cousins. 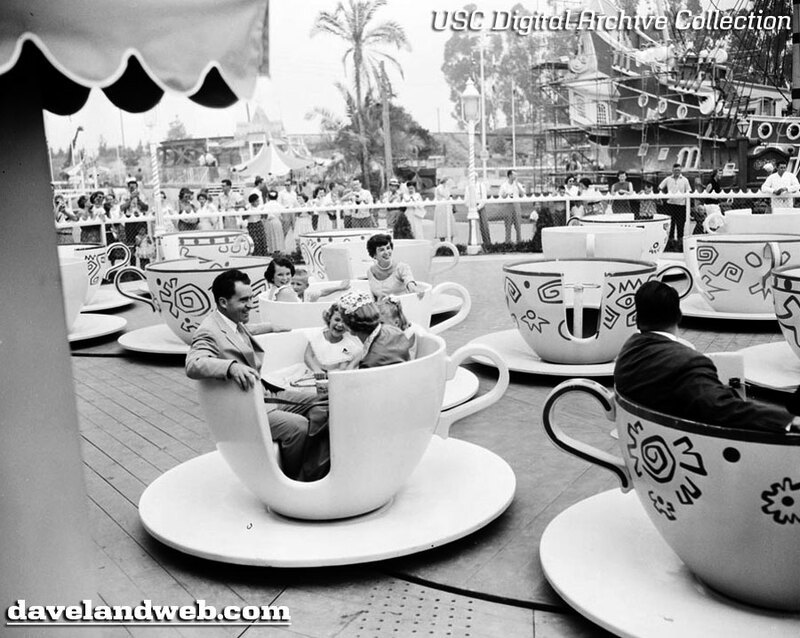 Next up are 4 fantastic shots of Mr. Toad’s Wild Ride; Nixon is with daughter Tricia and one of the cousins; Pat is in the car behind with daughter Julie. 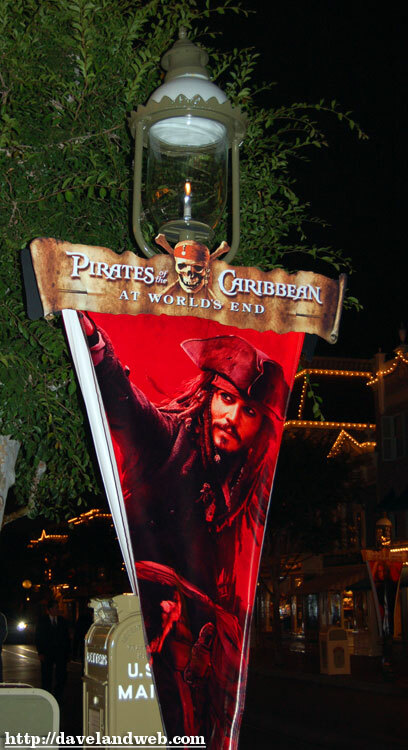 Exiting the attraction, all is well! Last one for today is from the Snow White’s Scary Adventures. Julie is turning around to see her sister Tricia emitting a playful scream on the mine car behind her. 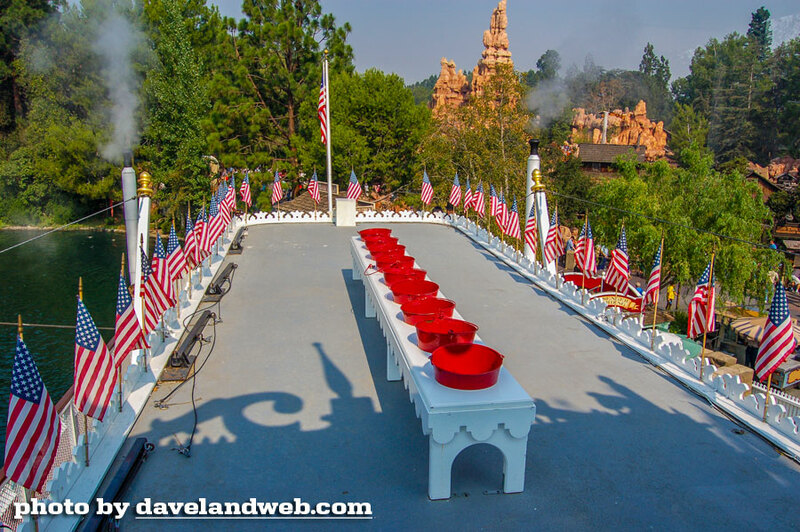 Come back tomorrow to see the Nixons exploring Frontierland! 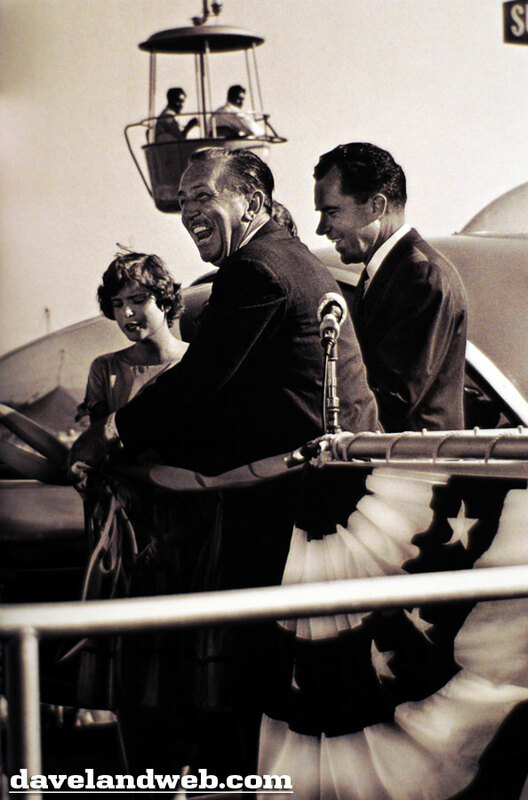 See more Nixon family photos at my regular website. 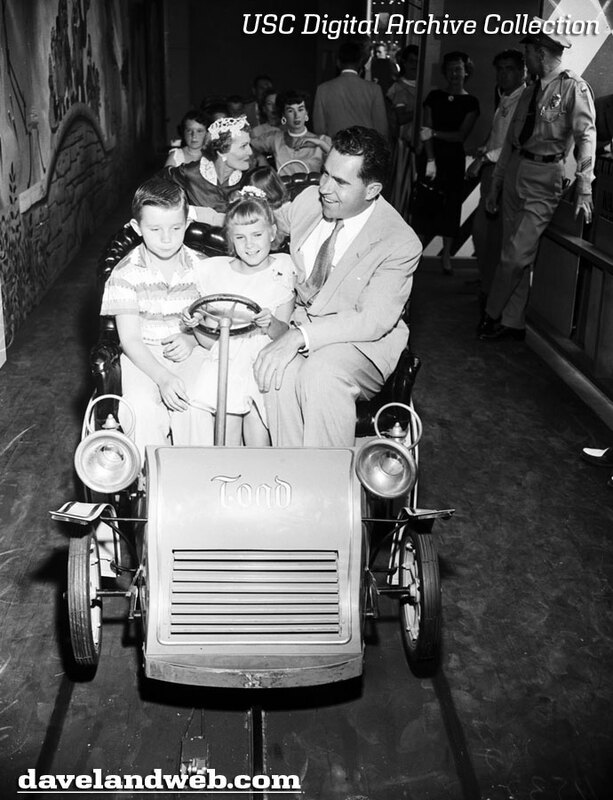 Because of former U.S. President Richard Nixon’s close proximity to Disneyland, he and his family were frequent visitors to the park during its early days. 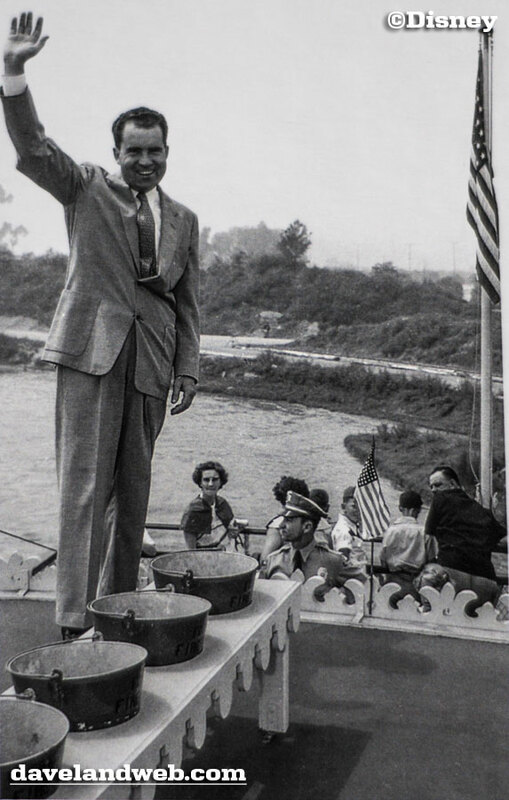 Nixon was proud that Walt Disney had chosen Orange County for Disneyland, especially since he had grown up only a few miles away in Yorba Linda. 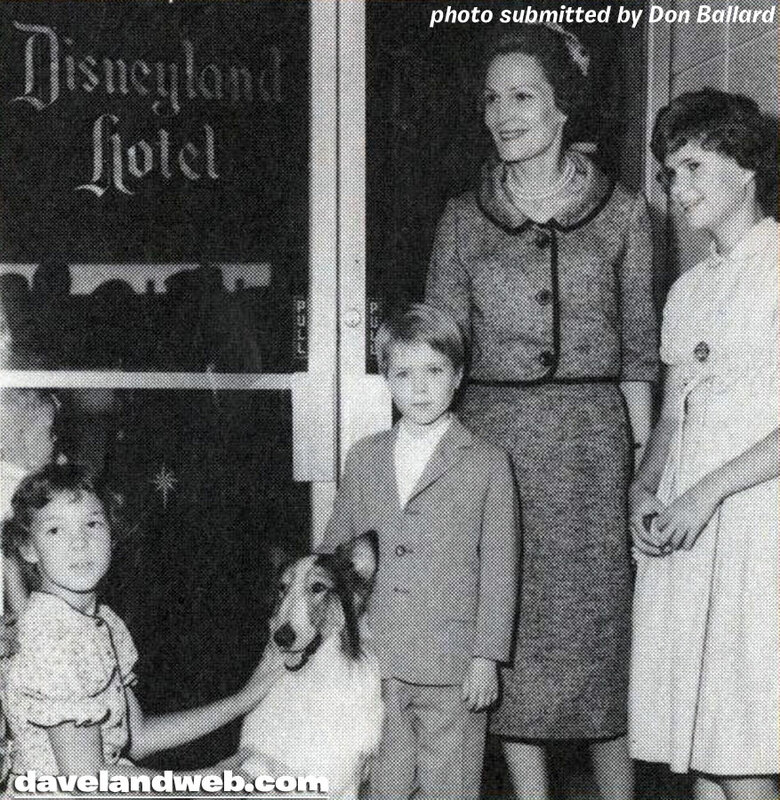 Nixon’s youngest daughter, Julie Eisenhower, was gracious enough to share with me some very fond memories that she has of her family, Walt Disney, and Disneyland. Many of the photos that will be posted here are from a book that Disney Executives gave to Julie as a tribute to her father. 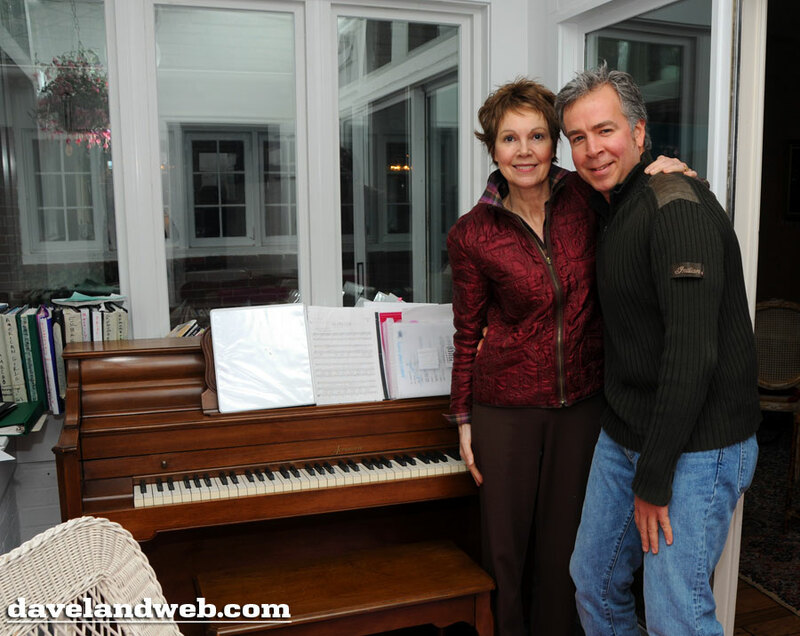 The photo of Julie & I shows us standing in front of her father’s piano. 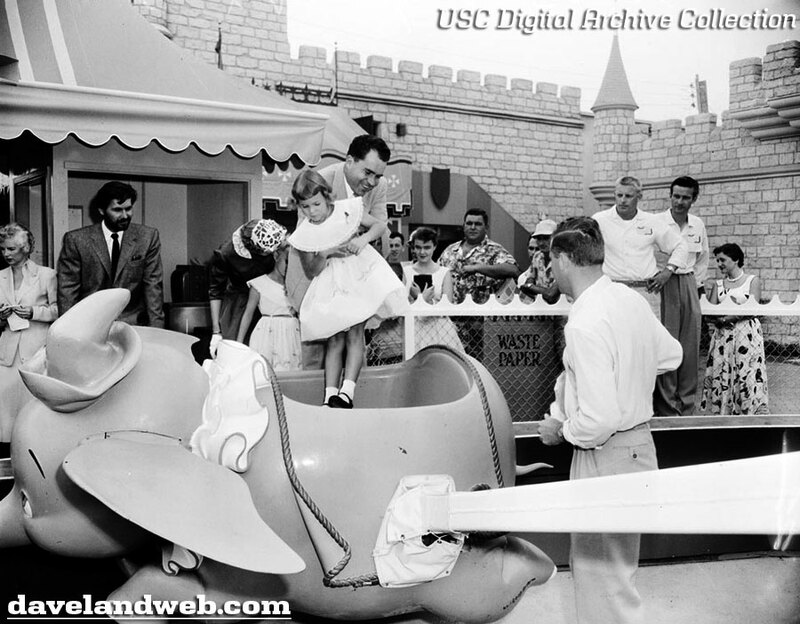 It was always a thrill for Julie to visit Orange County & Disneyland, as it meant that she could play with her cousins on both sides of the family: The Ryans (her mother) and the Nixons (her father). 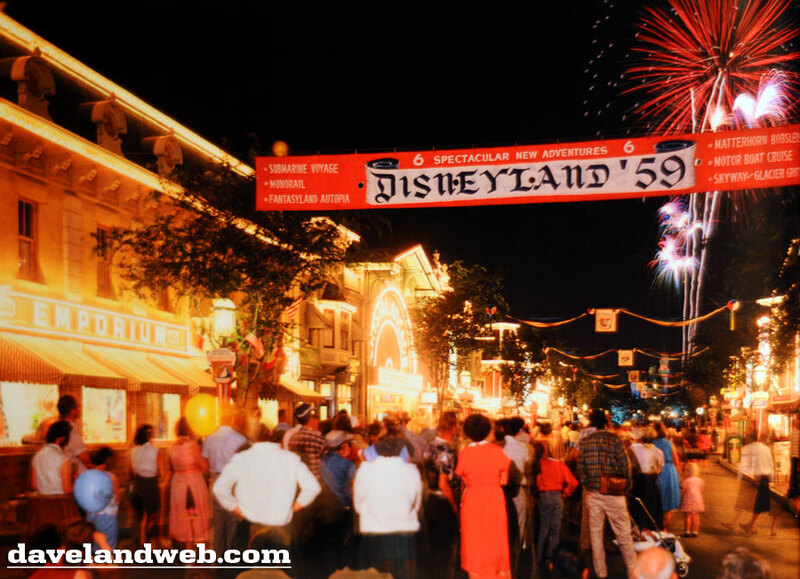 “Disneyland was a part of our lives. 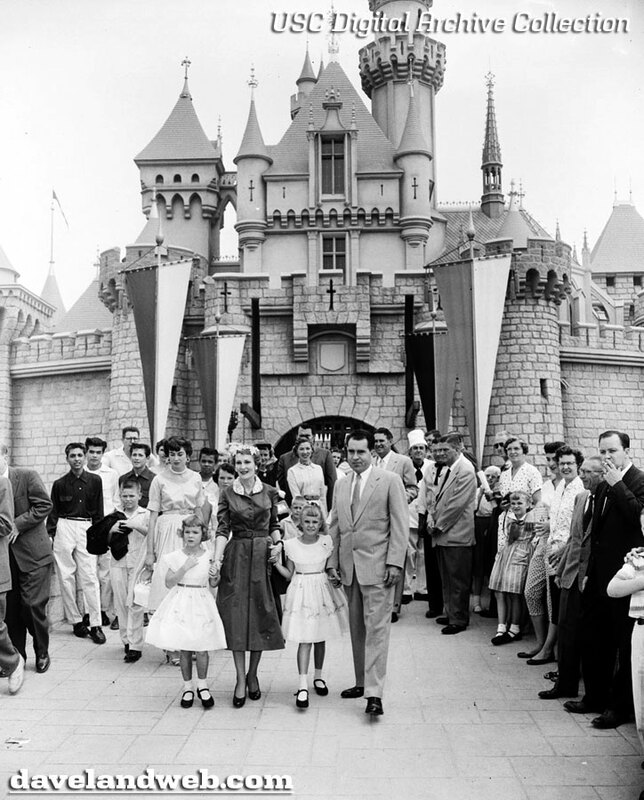 The major happy feeling that I remember about Orange County was seeing my cousins, which was always tied to a trip to Disneyland.” Between 1961 and 1963, the Nixon family would visit the park at least once every 3-6 months. 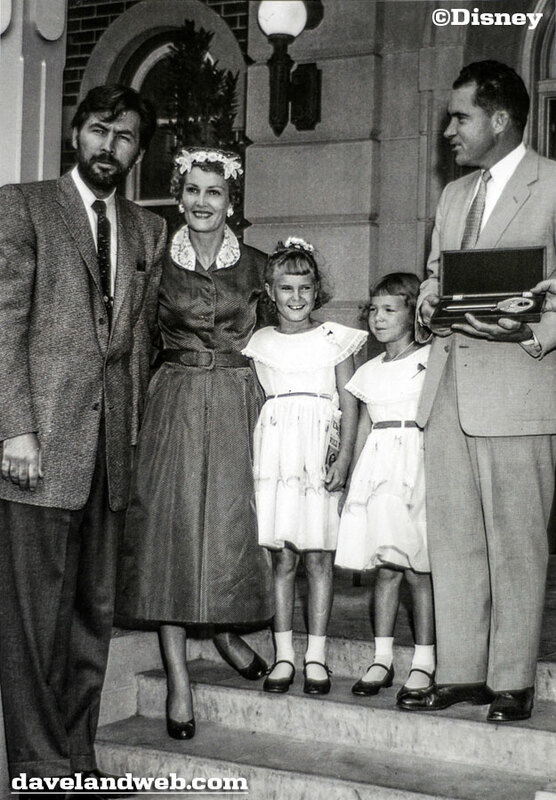 Her father was given the “Key to City Hall” by none other than Davy Crockett (Fess Parker). 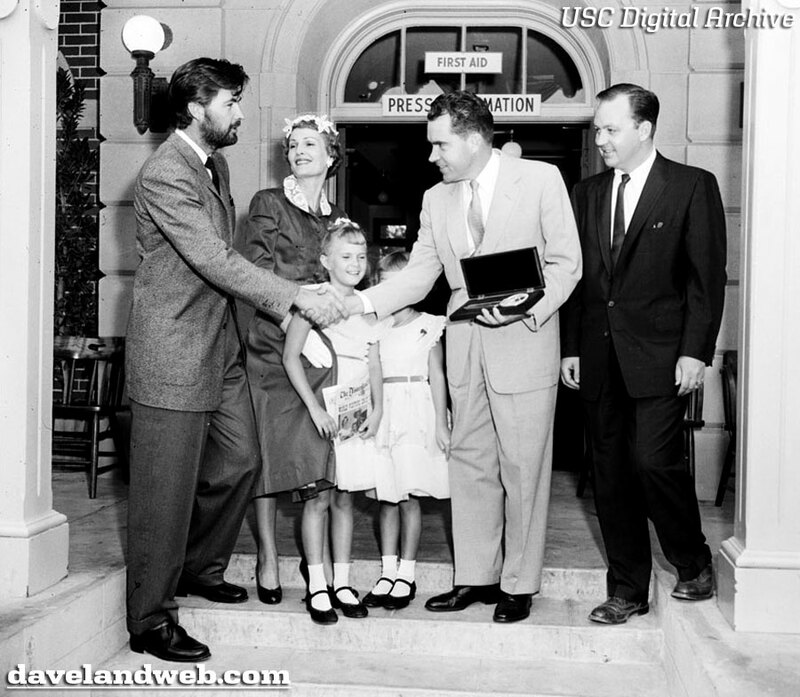 “I was in heaven, meeting Fess Parker!” From left to right: Fess Parker, Pat, Tricia (holding the Disneyland News), Julie, and Richard Nixon. 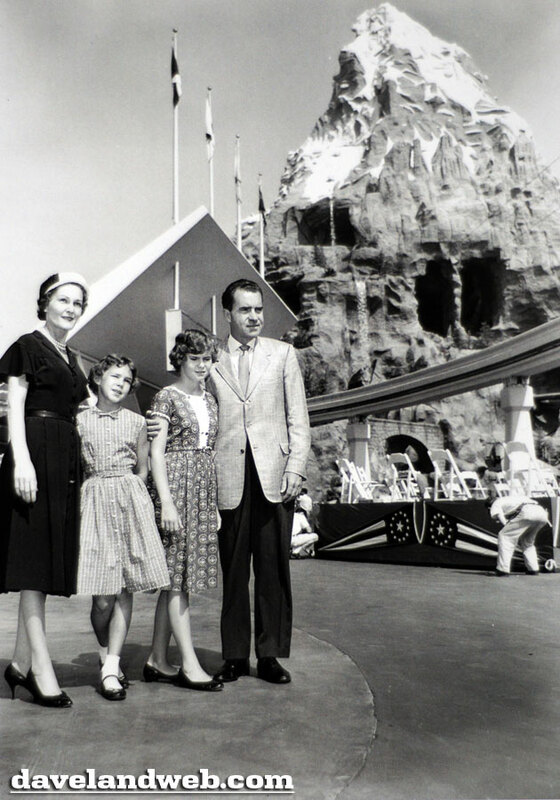 Here is the Nixon family posing in front of the castle; can you imagine your visit to Disneyland, wanting to ride all of the attractions as soon as possible, yet having to patiently pose for photographers each step of the way? 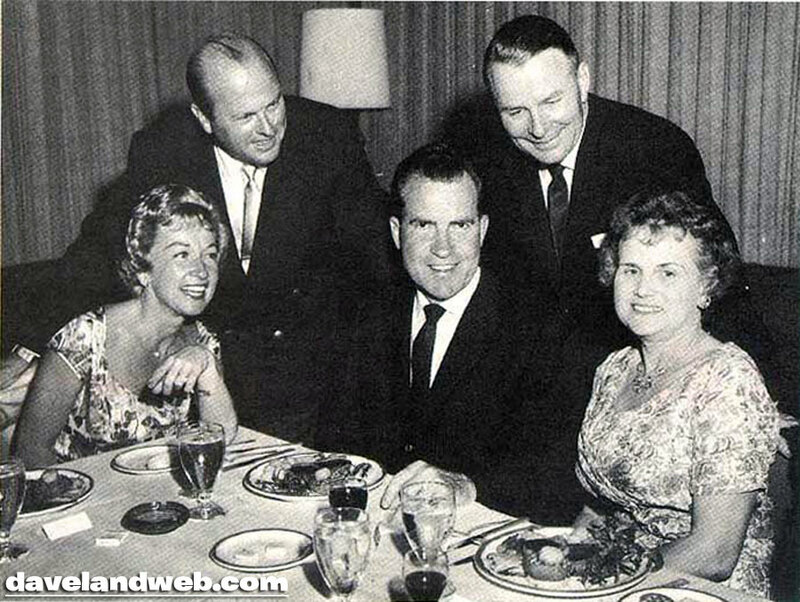 From left to right: Julie, Pat, Tricia, and Richard Nixon. 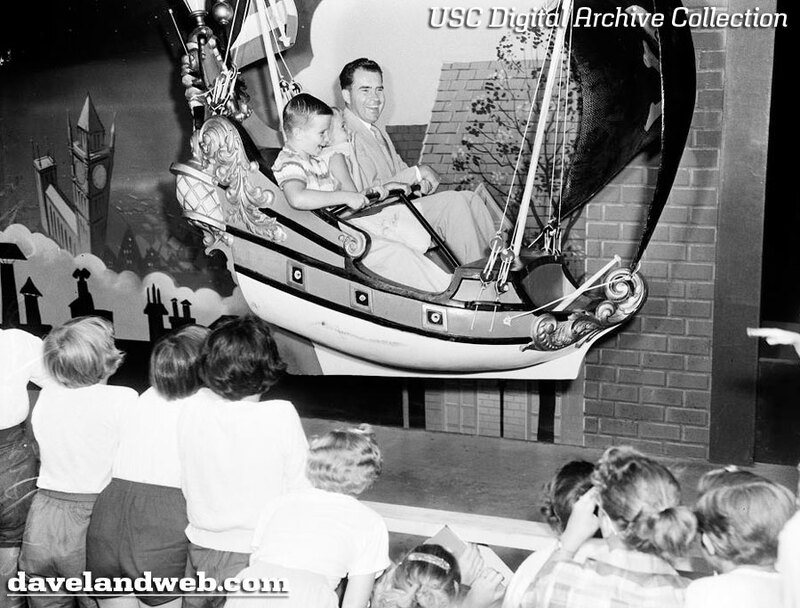 See more Nixon family photos at my regular website. 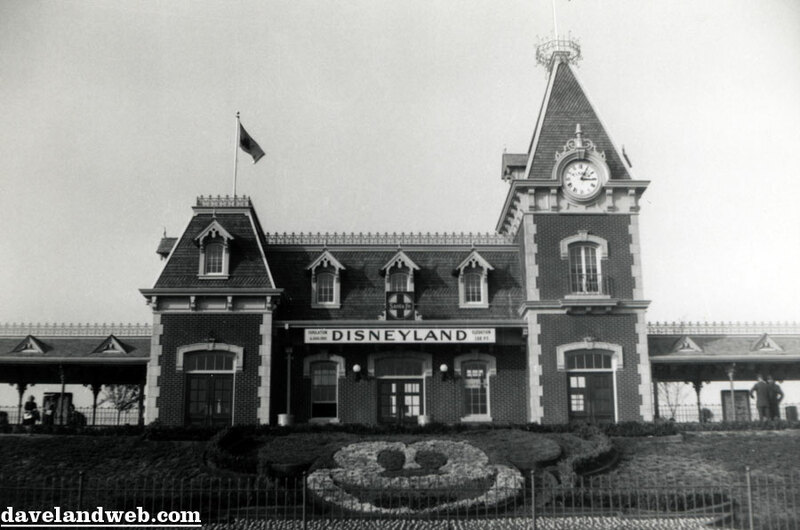 See more vintage and current Disneyland Railroad/Main Street Train Station photos at my regular website. 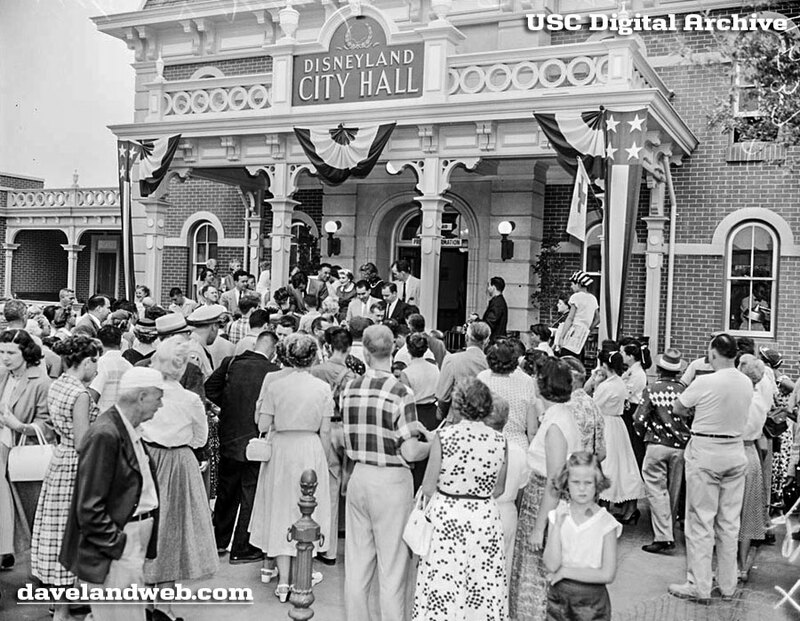 Labels: Disneyland, Disneyland Railroad, Main Street Train Station, main street u.s.a.
From June 1955 comes this construction view of Main Street, just one month until opening. 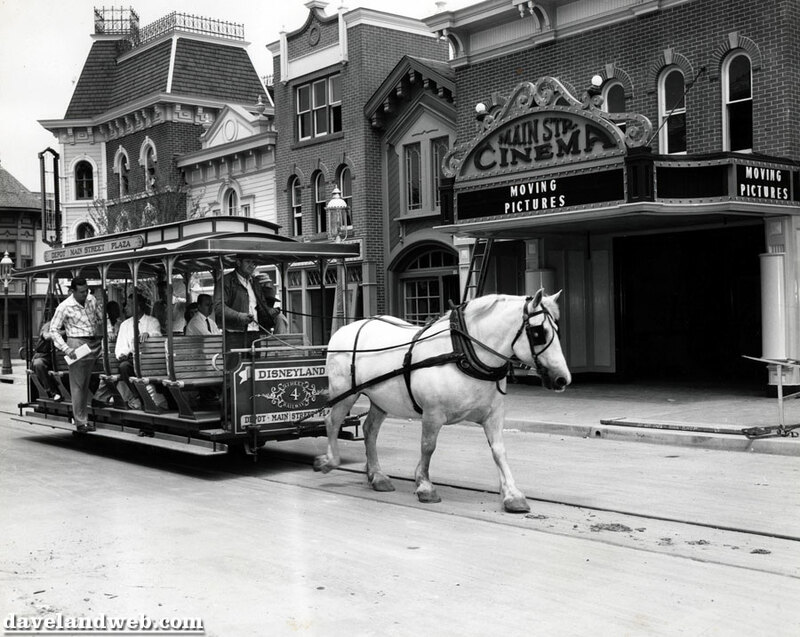 The “shirts” are taking a trial run down Main Street on the Horse-Drawn Streetcar; anybody able to identify them? 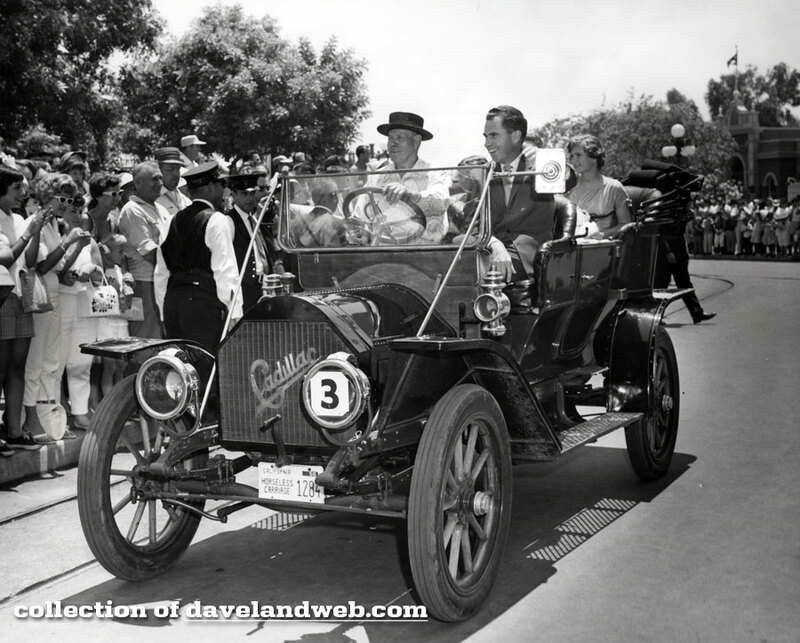 NOTE: Jason from Disneyland Nomenclature has just identified the driver as Art Chapman. 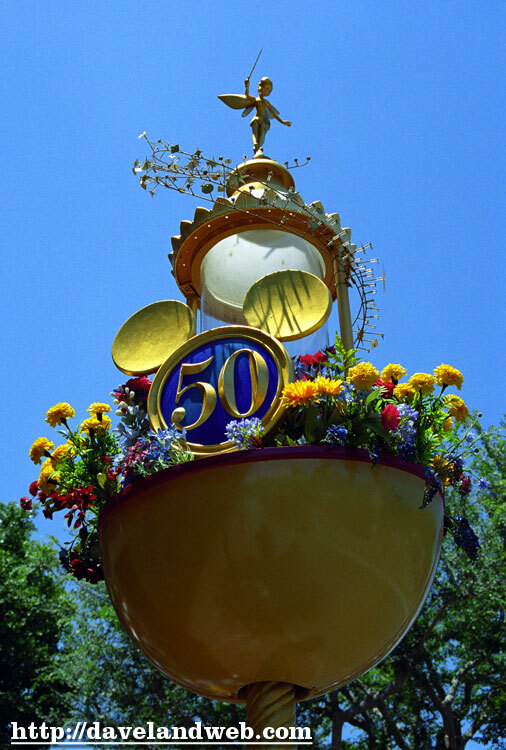 Although they’ve definitely seen a few coats of paint and various decorations over the years, it would appear that the streetlamps are still original. 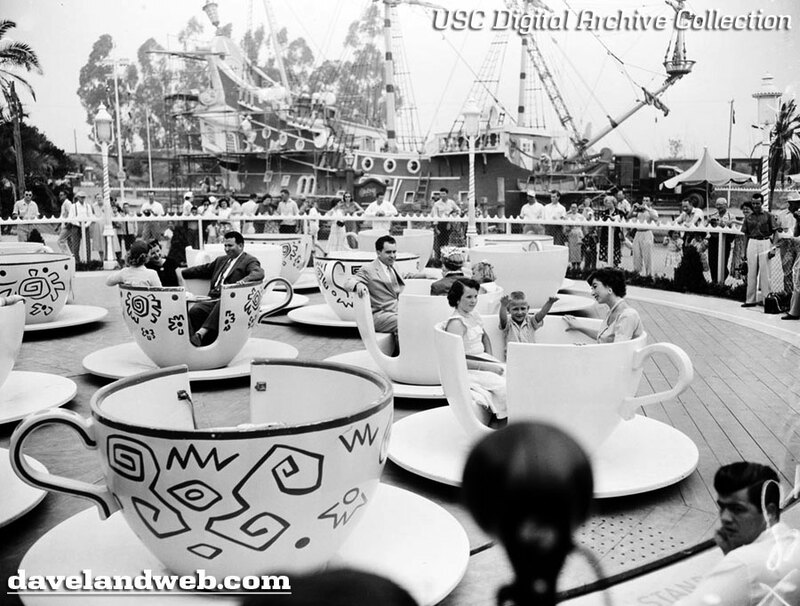 See more vintage and current Matterhorn photos at my regular website. 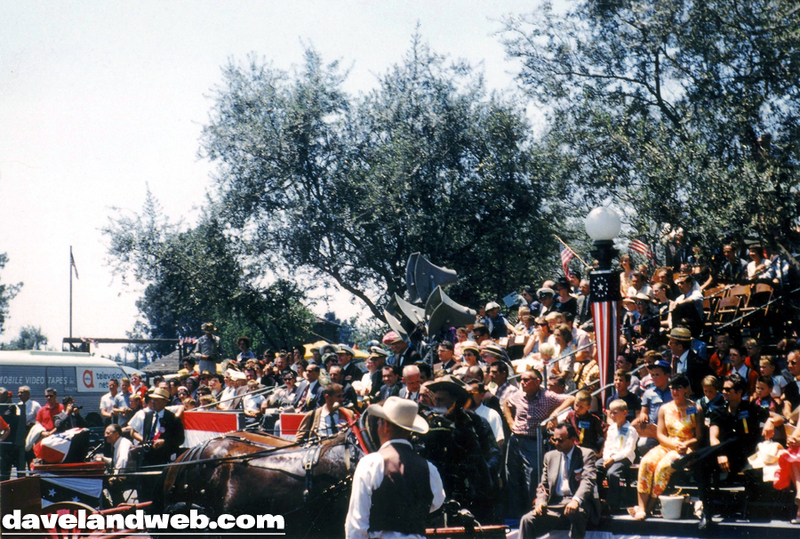 1956 in Glorious Color: Autopia Action!